Worldnetwork has extensive experience in commercial and industrial periodic testing. We supply on-going testing and inspection support to G4S Services in the security sector. We have many large contracts UK wide carrying out testing services. Poorly maintained electrical equipment is potentially very dangerous presenting a number of issues from electric shocks and fire hazards, to overloaded circuits and faulty sockets. 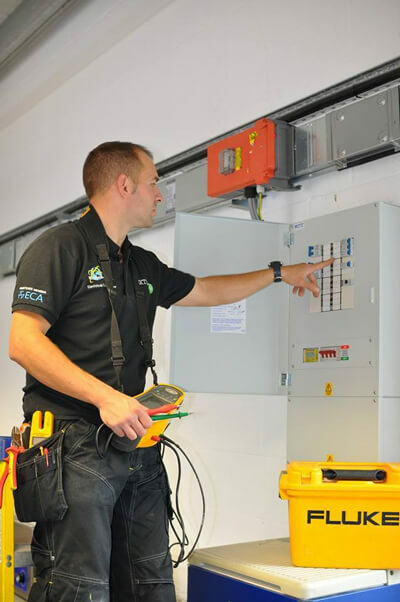 To protect the safety of your building, staff and the public it is your responsibility to ensure all your provisions are fit for purpose and regularly checked, tested and maintained. We off the full range of testing services to make sure you are compliant and safe. Maintenance and testing is crucial when considering the impact of your building on your business. Understanding the cost of any downtime or fault is vital. Routine and planned maintenance is imperative to safeguard against deterioration and wear and tear. Neglect can lead to faults and unplanned outages and severe business disruption. Making good these faults is then more costly than regular maintenance, testing and servicing programmes. Worldnetwork delivers EICR testing to its blue chip customers including G4S, Interserve, Babcock, Foster Freeman, Agylisis, BG Technical, Pure Offices & the Foyle Food Group. Our experience helps us to keep business disruption to a minimum and our use of planning meetings helps us to understand the cost to the customer of an unplanned outage. Worldnetwork recently won the Foyle Food Group contract to handle the fixed electrical testing and emergency lighting for a five-year period. Other recent contracts include Foster Freeman, Agylisis, BG Technical, Pure Offices, DW Sports and East Gloucestershire Tennis club to name a few. Our experience helps us to ensure that business disruption is kept to a minimum and our best advice and planning meetings help customers understand the loss in business and costs associated with unforeseen outages.